Microfluidics is defined as “the science and engineering of systems in which fluid behavior differs from conventional flow theory primarily due to the small length scale of the system” 1. Microfluidics deals with precise control and manipulation of fluids in micro and picolitre scales that are geometrically constrained to microfluidic devices with internal sizes ranging from approximately 1 to 1000 μm. When performing chemistry in microfluidic devices the short distances and the high surface to volume ratio of microchannels lead to reduced transport times of mass and heat. This results in fast and controlled heating and cooling. Compound concentration and temperature can also be regulated precisely. Small fluidic volumes dictate that regimes of low Reynolds number (< 250) where fluids are influenced by viscous forces rather than inertial forces. Without the inertial nonlinearity, microfluidic systems have regular deterministic flow. This condition generates in circular micro-channels typical parabolic velocity profiles and predictable flows. These basic properties give rise to the following main advantages that have made microfluidic technology attractive for chemical synthesis in both industry and academia 2. Higher Performance & Control. Several chemical reactions can generate more than one product from the same reactant. This depends on the kinetic versus thermodynamic control of the reaction pathway. The high level of control achievable in microfluidic devices offers the possibility to select one specific product over another with very high precision therefore increasing the chemical selectivity. In addition, enhanced heat and mass transfer combined with the greater control of reaction conditions and ability to operate at high pressures in small volumes lead to higher space-time yields (product formed per reactor volume and time) and and conversion than traditional bulk systems. When using microfluidic devices in particles synthesis these conditions result in a higher particle monodispersity compared to traditional batch synthesis. Small Reagent Volumes. There is a cost advantage in working with small volumes of precious reagents. Microfluidic devices use much less reagent than traditional bulk systems to obtain the same, and sometimes, more chemical information. In addition, small volumes facilate fast reaction screening and easier optical access to the reaction system. Rapid Reactions. Reactions occurring in microfluidic reactors are rarely run for longer than required to reach the equilibrium, as they can be closely monitored to determine reaction completion. Green Credentials. The improved heat transfer lowers the energy consumed per unit temperature rise leading to environmental benefits. Microfluidics is used in many different fields from industrial production to academic research and represent an important and relevant growing market. 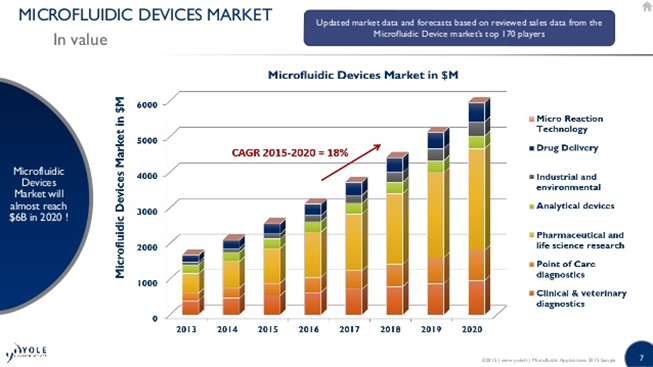 The microfluidic device market is expected to grow quickly, from $2.56B in 2015 to $5.95B in 2020. This annual 18% growth will still be mainly driven by pharmaceutical and health care applications 3. A list of applications notes made using Dolomite’s components can be found here. Dolomite’s products are used by many academic group in the world in different area of research. A selection of scientific pubblications can be found here. The idea of dramatically reducing the size of process plants as a means to render them more efficient both in terms of raw materials and energy consumption started in the 90`s. 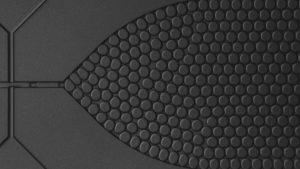 Since then a new fast developing research field, usually referred to as “microfluidics”, has attracted researchers analyzing the possibility of exploiting the advantageous properties of miniaturization. Nowadays, in microfluidic systems traditional scale-up is substituted by numbering-up, without the need for a pilot plant, shortening dramatically the time that it takes from formulation to production. This leads to the adoption of microfluidic technologies not only for analytical purposes but also for large scale manufacturing in process industries, particularly fine chemistry and pharmaceuticals. In more recent years microfluidic devices have also been extensively adopted as analytical tools for biochemistry and molecular biology applications. Novel microengineered structures can be made to perform many of the standard operations of interest to chemical systems. The advent of microreaction technology was initially underpinned by silicon microfabrication methods originally developed from the microelectronics industry. However, as new or improved precision engineering methods and tools become available, they allow manufacture of microengineered structures from metals, ceramics, plastics (PDMS) and glass. Dolomite design and manufacture different types of microfluidic devices or “chips” for various chemical and biochemical applications using glass. Glass is considered one of the best material that can be used in microfluidic applications and is largely employed due to its high solvent compatibility, surface stability, optical transparency and pressure resistance. The material is also naturally hydrophilic, biocompatible and chemically inert. Dolomite provides chips together with specifically designed connectors to be able to attach tubings to different microfluidic pumping devices. Capillary tubings are used from the very beginning to access small scale flows within the simplest feature. This solution provides cheap and simple approaches for continuous flow experiments with well known hydrodynamics and easy manipulation of operating parameters. Nam-Trung Nguyen & Wereley, S. T. Fundamentals and Applications of Microfluidics. (Artech House, 2002). Elvira, K. S., Casadevall i Solvas, X., Wootton, R. C. R. & de Mello, A. J. The past, present and potential for microfluidic reactor technology in chemical synthesis. Nat. Chem. 5, 905–15 (2013). Clerc, S. & Roussel, B. Microfluidic Applications – Yole Development Market & Technology Report. (2015).